For millennia people have enjoyed tea all over the world, creating myriad combinations of leaves, flowers, spices, and sweeteners. To this day the preparation and sharing of tea remains central to the social, religious and dietary culture of countries on every continent. Today's tea drinkers are forever on the hunt for new blends to satisfy their guests' tastes, as well as the changes in their own. Sweeter? Stronger? More bitter? Fruitier? Milk? Creamer? As any barista can attest, we all take our tea a different way! Enfuse is an ingenious flask that helps you make tea to your taste. Each Enfuse houses four separate compartments that can be filled with just about anything, allowing you to craft a custom blend every time you crave a cup! 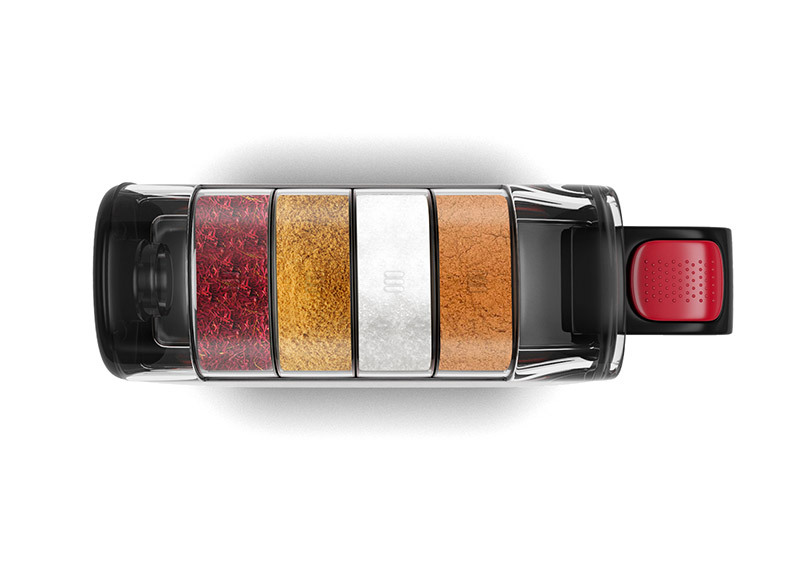 With a push of a button your Enfuse will release half a teaspoon of your chosen ingredient into the container below. The flavors, milk and sugar will dissolve as they pass through the spout, giving you the perfect cup every time, no stirring required. No mess, no effort, no need to stick to just one type of tea! Enfuse is the fun, intelligent solution for the discerning tea drinker.